Today in Masonic History Juan Luna y Novicio Passes Away in 1899. Juan Luna y Novicio was a Filipino artist and sculptor and political activist. Luna was born in Badoc, Ilocos Norte, Philippines on October 23rd, 1857. In 1861, his family moved to Manila where he attended Ateneo Municipal de Manila. He attained a Bachelor of Arts degree and excelled at painting and drawing. He enrolled in Escuela Nautica de Manila (Philippine Merchant Marine Academy) to become a sailor. He also took drawing lessons and enrolled in the Academia de Dibujo y Pintura (Academy of Fine Arts). Unfortunate his teacher felt his strokes were to vigorous and he was dismissed from the Academy. In 1877, Luna and his brother traveled to Europe where Luna studied painting. He entered Escuela de Bellas Artes de San Fernando (Royal Academy of Fine Arts San Fernando). There he met Don Alejo Vera, who was a well established Spanish painter of the time. Luna was unhappy with what was be taught at the new Academy and felt he could learn much more from Vera. He left the Academy and traveled to Rome with Vera where he was exposed to the art of the Renaissance. In 1878, Luna had his first public showing at the Exposición Nacional de Bellas Artes (National Demonstration of Fine Arts). From then on he was completely focused on painting and began creating many paintings, some commissioned and others on his own. In 1884, he appeared again in the Exposición Nacional de Bellas Artes. This time he was the first recipient of three gold medals given at the event. His friend and revolutionary José Rizal gave a speech congratulating his friend. In 1885, Luna established a studio in Paris. The following year he married his friend's sister Maria de la Paz Pardo de Tavera. Luna would often paint his wife as a subject. Unfortunately, Luna has was a very jealous man and he believed that she was having an affair with a Monsieur Dussaq. In 1892, in a jealous rage, Luna would kill his wife, brother-in-law, and mother-in-law. Just five months later he was acquitted of the charges on the grounds of temporary insanity. At the time there was also an unwritten "rule" that forgave men for killing unfaithful wives. In 1894, Luna returned to the Philippines and traveled from there to Japan. In 1896, Luna and his brother were arrested for being part of the Katipunan rebel army. The Katipunan had close ties to the masonic fraternity similar to the Sons of Liberty in the United States. He continued to paint in prison. In 1897, he was pardoned by the Spanish courts and he traveled back to Spain. He returned to the Philippines the following year. In 1898, Luna became part of the Philippine delegation at the Treaty of Paris, ending the Spanish-American War, which required Spain to relinquish control of it's empire. The Philippines specifically was ceded to the United States. After the Treaty of Paris, Luna was sent to the United States to try to get formal recognition of the Philippine Government. 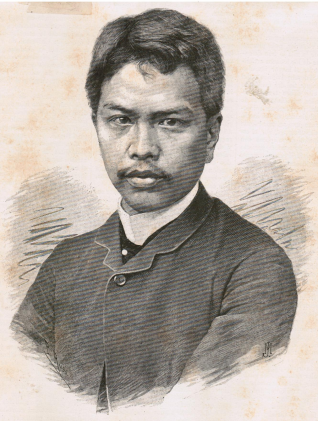 Luna returned to the Philippines in 1899 when he received word of the murder of his brother. Later that same year he traveled to China where he passed away from a heart attack on December 7th, 1899. Luna was initiated in Paris, France into Lodge Solidaridad No. 53. At the time the lodge members were acting as a Masonic club in Paris and were initiating members there.